This law firm wanted to replace its aging records management system with one that provided a seamless user experience for NetDocs, Aderant, and Intapp. 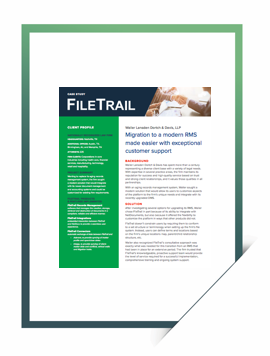 This prominent West Coast law firm wanted to rollout an integrated RM/DM platform that streamlined management for all of its paper and electronic files. 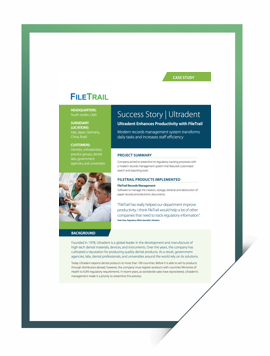 A manufacturer of high-tech dental products, Ultradent sought a cutting-edge records management solution for tracking regulatory documents. This Amlaw 100 firm needed to deploy a new records management system starting from the ground up with no legacy data to upload. Download this eBook to learn why information governance is more complex than ever. 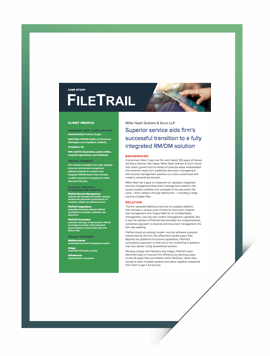 Try FileTrail free for 30 days.